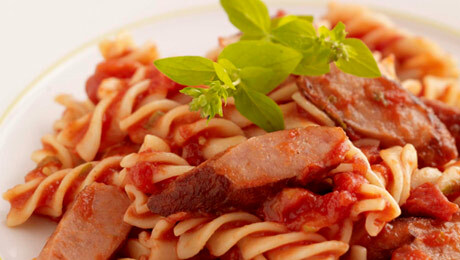 A tasty and very economical family meal – can be a great way to use up leftover sausages. Fry for about 8 minutes turning occasionally to ensure an even golden colour and cooked through. Remove the sausages from the pan and cut diagonally into bite sized pieces. Stir in the tomato puree, tinned tomatoes and dried herbs, season to taste. Simmer for approximately 15 minutes until the sauce has thickened. While the sauce is cooking, boil the pasta in a medium sized pan of lightly salted water as per pack instructions. Drain immediately and add a knob of butter & seasoning if required. To serve, place the pasta in a bowl and spoon over a generous serving of sausages and sauce. If you want a spicier sauce, add a chopped red chilli as you fry the sausages.